New for 2018, the @MyBGE Light Art Walk consists of 21 brand new light installations including On the Wings of Freedom presented by @kpthrive from 2016 returning artists @aetherhemera. Today begins the transformation of Baltimore into an interactive playground of large-scale light art installations, concerts, performances and conferences, thanks to the start of Light City, which runs through April 21. 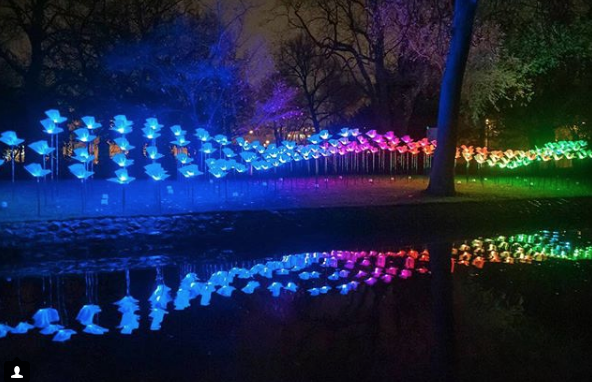 The event is the first free large-scale international light festival in the U.S. powering social change, but the accessible art in Baltimore doesn’t stop on April 22. The 20th Annual Maryland Film Festival will take place May 2-6 in its new home, the Stavros Niarchos Foundation Parkway Film Center, which debuted in May 2017. An $18.2 million “rescued ruin,” the Parkway, in Baltimore’s up-and-coming Station North Arts & Entertainment District, features year-round curated, bold programming that showcases films from every era, region, and genre, with a focus on independent, international, documentary, classic and cult-favorite films. The Jewish Museum of Maryland opens Inescapable: The Life and Legacy of Harry Houdini on June 24. The opening day will be marked by a recreation of one of Houdini’s greatest escapes. Professional escape artist Dai Andrews will recreate Houdini’s 1916 Baltimore stunt, in which he escapes from a straitjacket while suspended upside down from a 50-foot crane. Every summer, for three days in July, thousands of visitors of all ages flock to Baltimore to attend Artscape, the nation’s largest free outdoor arts festival. From July 20 – 22, attendees will enjoy a vast array of visual arts as well as live arts ranging from Baltimore Symphony Orchestra concerts to dance, opera and theater performances throughout city neighborhoods. There is also plenty of kid-friendly entertainment, so it’s a great way to explore art with the whole family. Artscape features over 150 fine artists, craftspeople and fashion designers, and showcases works in a variety of media, including sculpture and photography. The Baltimore Museum of Art will honor Baltimore native and uncompromising cultural force John Waters, with the first major retrospective of his work. John Waters: Indecent Exposure will run from October 7, 2018 – January 6, 2019 and examines the artist’s influential career through more than 160 pieces of his work dating back to the early 1990s. The pieces, context and format (examples of his earliest films will be presented in a peep-show format) reflect the quirkiness of Waters’ humor, satire and irreverence in a way never-before-seen. Baltimore-born UNION Craft Brewing will be the anchor tenant of a major commercial project, Union Collective, transforming 10.5 acres of warehouse space into a destination for locally-minded consumers to interact with Baltimore makers and purchase Baltimore-made. Tenants include local hot sauce brand Huckle’s, Baltimore Whiskey Company, The Charmery ice cream, Vent Coffee Roasters and more.